Acer pectinatum subsp. maximowiczii is a snakebark maple found in central China. Depending on the taxonomist, it is one of at least five subspecies of Acer pectinatum. Other taxonomists do not agree that this is a subspecies of Acer pectinatum, and instead suggest that it is its own separate species, Acer maximowiczii. What is the origin of these disagreements? In the case of these five entities, the origin is “evolution in action”. One difficulty with plant names is that they are subject to the notion that the names must somehow represent evolutionary relationships, and when they don’t, the names must change. This system is a great aid to understanding plants because of its organizational structure. Unfortunately, the system can break down a little bit when attempting to impose it on biological reality. Unlike a structured hierarchy of names, biological reality is fuzzy. Here’s an analogy that pertains to the situation with Acer pectinatum. Imagine that a species is represented by a piece of soft gum. Pulling the gum apart into two separate pieces represents the formation of a new species from a parent species. But what would happen if it took tens or hundreds or thousands of thousands of years to pull apart that soft gum into the two separate pieces. At what point, as an observer, would you recognize that a new piece is being separated from the parent? At what point do you say that the thin stretch of gum between the two pieces is small enough to be insignificant, and that for all practical purposes, you have two pieces of gum? What happens if somewhere around midway between the gum being pulled apart, you were asked to decide whether you currently have two pieces of gum, or simply one piece of gum that is being pulled apart into two? That’s the challenge of Acer pectinatum and its subspecies. Some taxonomists say they see two pieces of gum, even if the break is not yet a clean one. Others say they see one piece of gum that is splitting, but it’s still one piece of gum. There’s a good reason why these very-closely-related-for-now-in-evolutionary-time taxa are called “species complexes”! Nature resource link: Hummingbirds and Torpor (via GrrlScientist – link to Twitter account as blog is now abandoned) shares a fascinating account of the energy conservation adaptations of these crucial pollinators. Having photographed and studied mushrooms these past few years, I have become very familiar with the notion of species complexes. In fact, narrowing down a specimen to a certain species complex is often about the best field ID I can do (sometimes I’m just happy if I can just get the genus!). In the case of the snake-bark maples, and indeed with all “species complexes” I am content with a rough identification and letting the splitters and lumpers duke it out for naming supremacy. A name is just a name, and I can still appreciate the beauty of a tree or a mushroom, whatever it is called. Thanks Matt. I agree re: appreciation. I absolutely need to add that the scenario above regarding ongoing speciation in the Acer pectinatum species complex is by no means a good analogy for the mechanism of speciation in all organisms. The same consideration applies to cactuses in particular, but also in other fields such as ornithology. My way of looking at it is that all living things including ourselves are part of a continuum, like a light spectrum, and that the “piece of gum” has never completely broken. This is actually closer to Acer pectinatum subsp. maximowiczii (Pax) E. Murray (or simply A. maximowiczii, as it appears in the Flora of China). The two species (or subspecies) are closely related, but can evidently be distinguished on a number of more or less obvious characteristics. Acer pectinatum subsp. maximowiczii has glabrous petioles (vs. pubescent in subspecies laxiflorum) and more prominent basal lobes, for example. I was first alerted to the true identity of this plant when it flowered some years ago (I’m afraid I didn’t notice this post or the error in the database until quite recently). This plant’s inflorescences are definitely upright (i.e., standing stiffly above the foliage), whereas those of subsp. laxiflorum tend to hang down (hence the name). Two of the authors of the Flora of China Acer account (Piet de Jong and Chen Yousheng) were at the garden recently and they agreed that this plant (SICH 200) is closer to A. maximowiczii than to anything else. However, they both said that it was not exactly typical for the species. Of course, this is not the first wild-collected maple at UBC that doesn’t conform to an existing species description. But it is incredibly frustrating for those of us who have to decide on what name to put on a label. On the other hand, it probably represents introgression between these two species, and there’s some comfort in knowing that whatever it’s called, this particular tree is a biological reality and ultimately, its presence in the collection is adding to our understanding of variation in wild plants. I just wish there was a way to put a name on it that was digestible to people. I finally updated the name / entry to account for this in early 2018! 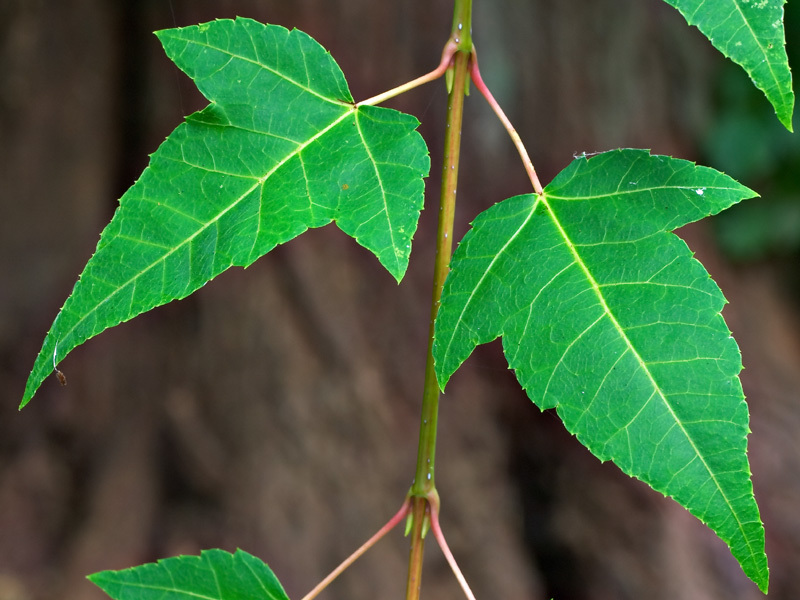 This was originally posted as Acer pectinatum subsp. laxiflorum, if one didn’t get that from Douglas’ writings. How about “affinity A. maximowiczii” or similar self-explanatory phrase of your choice?